to represent a great patient care. to represent great patient care. Our philosophy is to provide the best possible care recommendations, and then allow the patient to choose the type of care they wish to receive. We hope to create lasting relationships with patients who are committed to regaining their health, and who allow us to participate in their full recovery. The committed patients who listen and take action on our recommendations get the best results. Sometimes patients don’t realize that their lifestyles contribute to many of their health problems, so we ask our patients to be pro-active in their care. Our mission at Sandstone Family Medicine is to provide patients the most innovative and highest quality care. We strive to form lasting relationships with the entire family by including patients in the decision-making process and acknowledging them as active participants in their health. Sanstone Regenerative Medicine can greatly reduce the need for surgery by treating injured tissues before the damage progresses any further. The goal of regenerative therapy is to heal injured tissue and not just mask the pain. Imagine alleviating your pain without the need for surgery by delivering biological cells or cell products into a diseased area of the body to stimulate the healing process. By using neurofeedback we are able to retrain the brain by correcting frequency abnormalities associated with various neurological conditions such as ADD, ADHD, autism, anxiety, depression, PTSD, memory loss, and auditory processing issues just to name a few. At the Sandstone Center for Neurofeedback, we combine neurofeedback therapy with various brain-base therapies in order to stimulate optimal results. The doctors of Sandstone and the staff, without exception, show a real concern for their patient’s current situation. The evaluation is as thorough as I’ve ever had performed. The evaluation that is performed gives Dr. Tony the information needed to formulate the very best method and series of treatment to customize your own personal recovery. I look forward to and have complete confidence that Dr. Tony will have a 100% success rate in my personal recovery. What started as a chiropractic practice, treating people with pain, stiffness and limited range of motion has become one of the fastest growing medical practices in the area. The reason for their success? Dr. Tony’s philosophy that the patient must be an active and willing participant in their health and recovery. Rather than bullying patients into treatment plans that may not work for them, Sandstone strives to provide the best possible care recommendations, and then allow the patient to choose the type of care they wish to receive. 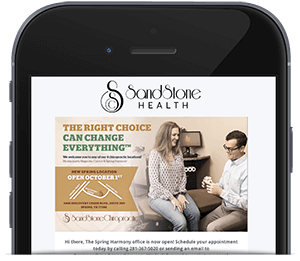 With an eye toward creating lasting relationships with patients who are committed to regaining their health, Sandstone believes the only way a patient is successful is if they are a partner in the process. This philosophy has paid off as patients who listen and take action on the recommendations made by one of Sandstone’s providers experience the best results. We specialize in Chiropractic, Family Medicine & Neurofeedback. Visit us at numerous Texas locations: Spring, Conroe, Montgomery or Magnolia.